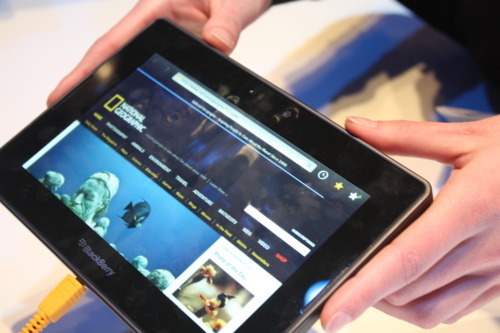 It was just announced today, and there aren’t final specs or pricing for it yet, but the BlackBerry PlayBook looks pretty cool. The tablet looks like an iPad, but smaller, with a 7-inch screen. It connects to your BlackBerry handset via secure Bluetooth for syncing purposes, and can tether from your handset for cellular connectivity. Some nice details: Flash + HTML5 support; 3MP front-facing camera; 5MP rear-facing camera (though will we take pictures with our tablets?? ); HDMI-out, MicroUSB port. All the stuff people want in their iPads. The Playbook will come out in Q1…pretty soon. RIM wouldn’t let me pick one up and play with it, but from what I saw, the navigation looks smooth and intuitive.